The primary function of the epidermis is to produce the protective semi permeable stratum corneum that permits terrestrial life by preventing water loss, maintaining satisfactory hydration of the skin, and preventing overhydration. -* basal layer = stratum basale = germinativum layer (single layer): the germinative or proliferative compartment which gives rise to keratinocytes of the more superficial layers; it is composed of columnar to cubic cells with elliptical nucleus rich in chromatin; basal cells are attached to a non-cellular basement membrane that separates the dermis from the epidermis. -* spinous layer= stratum spinosum = pickle cell layer (5-15 layers) made of polygonal cells in the lower layers that flatten in the upper layers and that appear connected to each other by prickle structures which correspond to desmosomes . -* granular cell layer= stratum granulosum (1-3 layers) made of flattened granular cells which contains keratohyalin granules and lamellar bodies . -* horny layer = stratum corneum (5-15 layers), the outermost layer of the epidermis, composed of non-viable but biochemically active, large, flat, polyhedral cells named corneocytes. The keratinocytes (= keratin-producing cells) are the main epidermal cell type (90 to 95 %). The other epidermal cells include melanocytes, Langerhans cells and Merkel cells. The average thickness of the epidermis is 100 µm but can vary from 50 µm on the eyelids to 1 mm on the palms of the hands and soles of the feet. The epidermis regenerates continuously and this constant turnover is mediated by epidermal stem cells , which reside with their progeny, termed transit amplifying (TA) cells, in the basal layer of the epidermis. The TA cells undergo a few rounds of cell division before they initiate terminal differentiation, named keratinization or cornification. During this process, TA cells permanently withdraw from the cell cycle, initiate expression of epidermal terminal differentiation markers, and move suprabasally. Within the epidermis, stem cells and their differentiated progeny are organized into columns named epidermal proliferation units. The suprabasal spinous and granular layers contain cells that have largely lost proliferative potential, but are still living and functioning. The spinous layer is characterized by the switch from expression of the basal cell keratins (K5, K14, K15) to the suprabasal epidermal keratins, the type II keratin K1 and subsequently the type I keratin K10 and by the production of involucrin , a marker of early differentiation, and of lamellar bodies in its upper layers. The spinous cells will continue their differentiation to form the cells of the granular layer. Granular layer is characterized by keratohyalin granules, lamellar bodies and the expression of the late differentiation markers, loricrin and filaggrin . 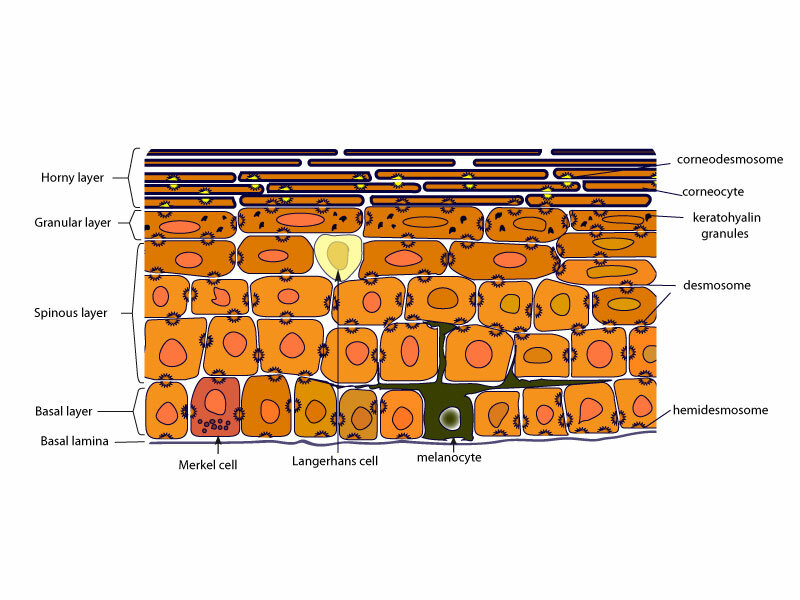 Continued differentiation of the granular layer cells results in formation of the transition zone which separates the dead from living epidermal layers. It is in this zone that the cellular constituents are extensively enzymatically remodeled. This remodeling ultimately results in the formation of covalently cross-linked terminally differentiated corneocytes of the horny layer, at the skin surface. In the horny layer, the corneocytes have lost their nucleus and cytoplasmic organelles and can be considered as a network of keratin intermediate filaments surrounded by a very stable cornified envelope made of cross-linked proteins. Transglutaminases are the enzymes responsible for cross-linking between proteins and participate in cornified envelope formation. Ultimately, the full differentiation process results in the formation of corneocytes momified in a lipid matrix. The horny layer is responsible for the skin barrier function that protects the skin. 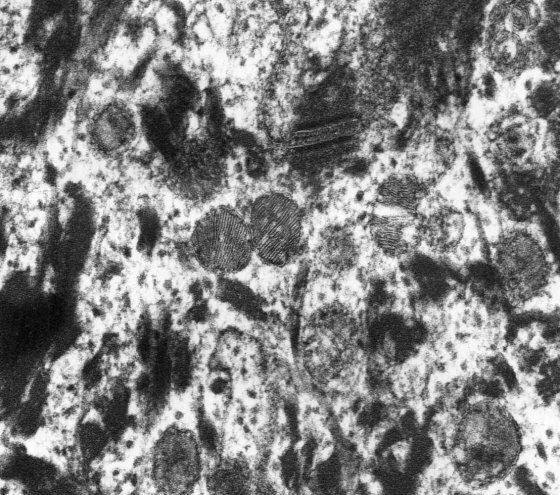 In humans, the whole process of keratinocyte differentiation normally takes about 52-75 days but can be much quicker in some skin diseases such as psoriasis. 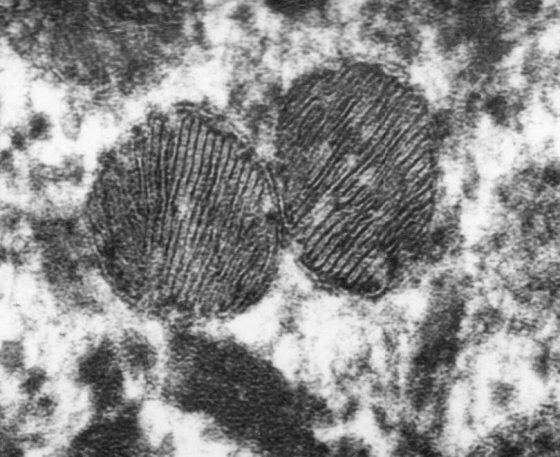 Cohesion in the epidermis depends on the presence of specialized adhering junctions, named desmosomes, between corneocytes and their modified versions hemidesmosomes and corneodesmosomes respectively encountered at the dermal-epidermal junction and in the horny layer and structures such as adherens junctions, gap junctions and tight junctions. 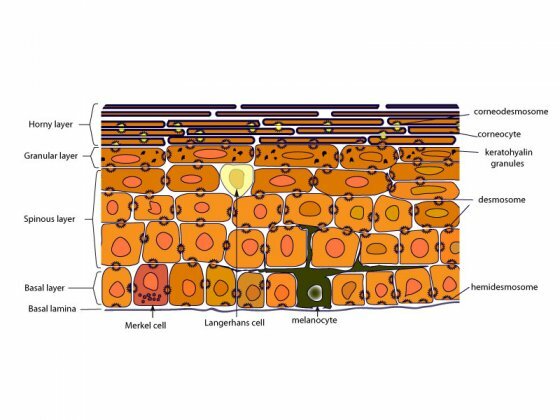 The inter-keratinocyte spaces in living epidermal layers is filled with extracellular matrix molecules involved in tissue hydratation, nutrition, and regulation of cell proliferation and differentiation. In the horny layer, extracellular lipids released from the lamellar bodies self-organise into multi-layered sheets, essential for the barrier function. en STRUCTURE AND FUNCTIONS Normal human skin structure Epidermis ?